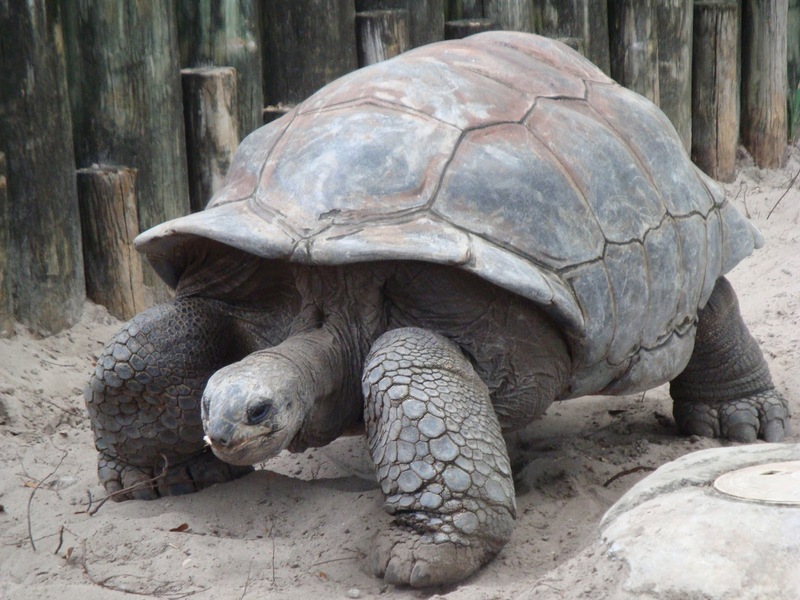 Take it slow over the holidays. If you've followed the news in the last couple of days you'll probably have read a little bit, some of it possibly accurate, about Podemos, Pablo Iglesias and the results of last weekend's election. 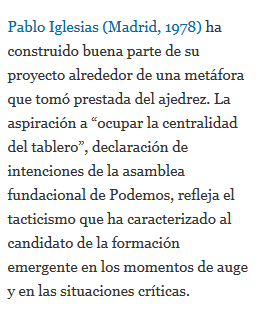 What you probably won't have read is that Iglesias's aim for Podemos is expressed in a phrase borrowed from chess. 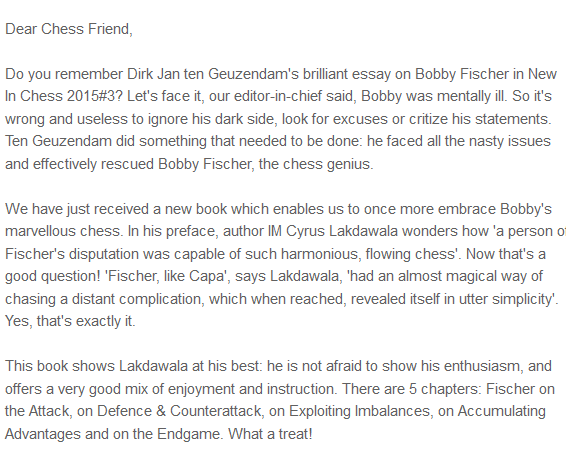 has built a good part of his project on the basis of a metaphor which he borrowed from chess. The metaphor, which of course is not at all a metaphor in the game itself, is "ocupar la centralidad del tablero", which, as I'm sure you can work out, is "occupy the centre of the board". The phrase was apparently included in the founding statement of Podemos when it was set up only last year. Guo-Kjartansson, London Chess Classic Open, round two, 5 December 2015. 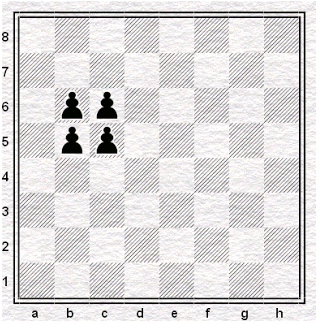 From Chess Today 5508 by way of Angus French. 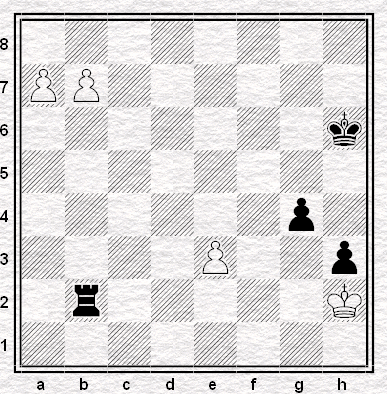 White, outrated by several hundred Elo points, nevertheless has a draw when she wants it against her IM opponent, but naturally, with two pawns on the seventh, she wants more. They first meet as ten-year-old chess prodigies - both lonely, intent on winning, both wearing the symbol of the gold coiled serpent. They know the uses of pleasure, the secrets of pain, the impact of evil turned upon itself. They understand the deadly forces that grip the world in swift violence, and sudden death. 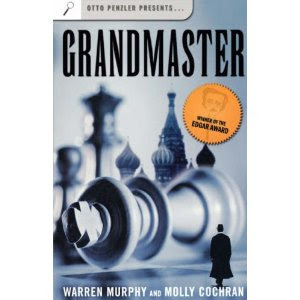 But only one man may be the Grandmaster. 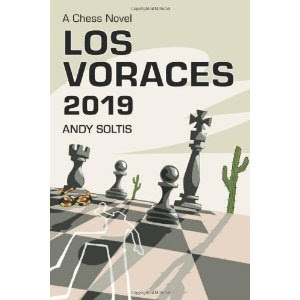 A better bet than Los Voraces 2019 as a self-given Chrimbo gift, perhaps. 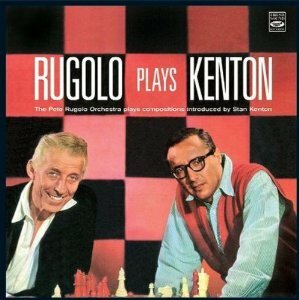 The Pete Rugolo Orchestra: Rugolo Plays Kenton (Capitol, 1958). Leonard Barden needs your help. I have been lodging in a house in Sydenham, South London, for the past ten years. A few weeks ago my landlord told me that he was selling up due to mortgage problems and that I would have to leave by the end of this month, ie by 31 December. I have been looking for somewhere else, but so far without success. I have been paying £100 a week, but most advertised rooms are much more expensive than that. Even more of a disadvantage is that nobody wants a tenant in his eighties. I have applied to Lewisham council, but it is unclear whether that will produce a result and even if it does the bureaucratic wheels grind slowly. I even tried the local chess club to see if anyone would put me up, but no luck. Hence this approach to Forum members. My needs are rather modest, basically a table and chair to work, a place fairly close to public transport and shops as I don't have a car, within the area covered by a Freedom Pass and ideally within reasonable travel distance of London Bridge where I have to go at weekends. I can pay up to around £100 a week, and as an extra would be available for chess training games/analysis/coaching if desired, though this is entirely optional. If anyone has a suggestion, please send me a pm or alternatively email me at Leonard.Barden@guardian.co.uk. Even an offer of a camp bed on somebody's floor for a few weeks might make the difference, although naturally I'd prefer the option of a longer period. If you can help, please contact Leonard. If you can't, please distribute in the general direction of other people, in case they can. In the previous - also unplanned - episode 6 of this Played on Squares sequence we took the opportunity to examine the Social Chess Quarterly and the Empire Social Chess Club in the 1930s. This was a necessary prelude to our reacquaintance with Marjorie Strachey who, as far as our researches have taken us to date, was the only real chesser in the Bloomsbury Group (the theme of the series - though there isn't much Bloomsbury in these two supplementary episodes). 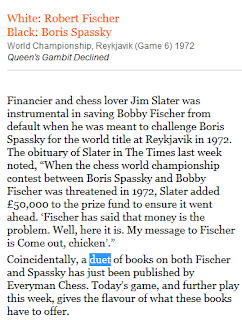 Marjorie played in a few proper chess tournaments in the mid/late 1930s, and - as we discovered by accident in the British Library, just a few days after #5 was published - she claimed a serious chess scalp thenabouts. We'll get to this later. Episode 6 ended with Arthur Firth, the Editor of the SCG, announcing in his magazine the closure (in July 1935) of the ESCC's rent-free clubroom at Whiteley's. So now we need to establish what happened next, and - while we are about it - just who was Arthur Firth. 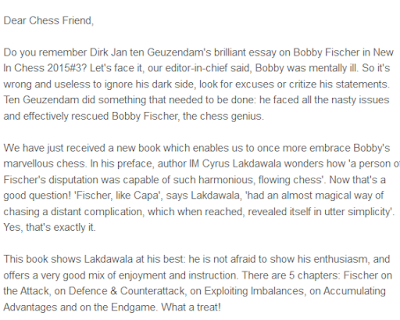 To get us on our way we will retrace our steps a little, and say a bit more about the Empire Social Chess Club - and someone who we have met before in another chess history context. The circled figure is Ernest Montgomery Jellie (1866-1949). You may remember him from this post on the Blog almost exactly a year ago to the day when we recounted his adventures with Hampstead CC. EMJ was not an especially exceptional chess player in those late Edwardian years, but - as we were pleased to document - he was certainly a dedicated one, and had his moments at the board. 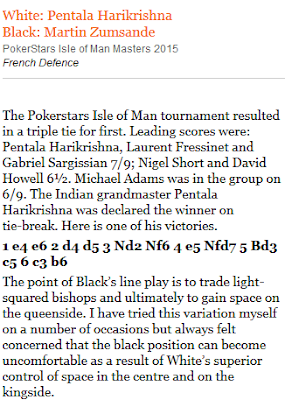 He had his moments off it, too: for example fathering a son - the grandfather of my chess colleague Andrew Stone (a top board of Streatham and Brixton CC in the London League). It was because of this quirky coincidence across the decades that EMJ was featured twelve months ago. 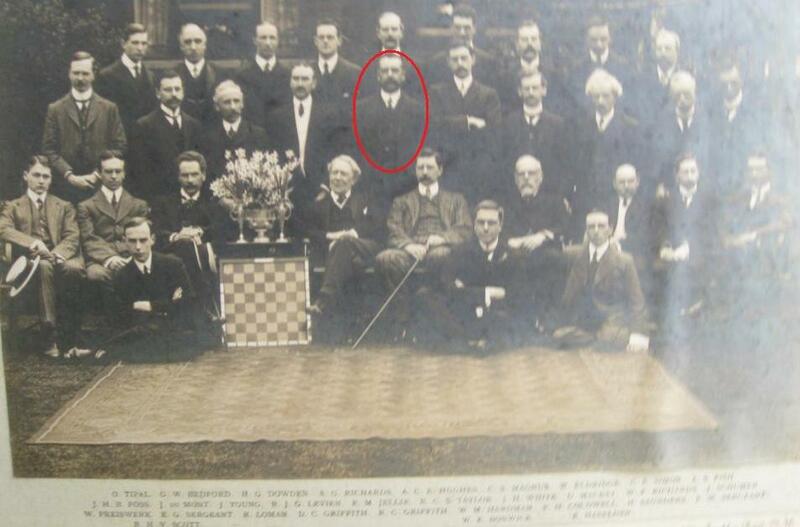 It happens that in addition to the above-mentioned Hampstead CC, Andrew's great-grandfather was a member of the Empire Social Chess Club - as we'll show below. Thus he can be placed - circumstantially, at least - in chessic proximity to Marjorie Strachey. It was as an ESSC member, as you will have surmised, that Marjorie had her singular chess triumph. On account of this connection, Ernest Montgomery Jellie merits our attention once again. So, Polgar reckons 700 million? Kirsan can do better! Ray's Times column for 17 November was about an iffy line of the Tarrasch French. He's right, I think: even the UK's foremost French player has struggled in that line. I played it myself, once, in a club game in South Shields, and got away with it, but I doubt I'll give it another go. 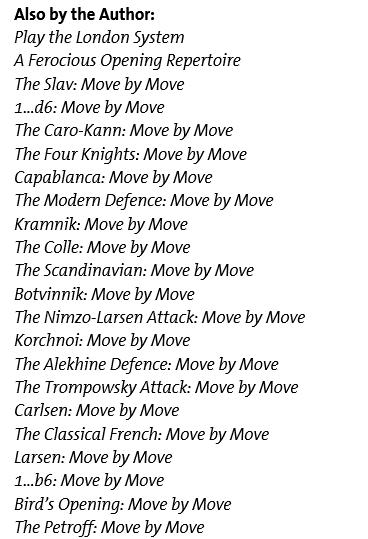 It was round about the turn of the millennium, when I was playing all sorts of nonsense - but still, I found I liked other versions of the French (the MacCutcheon, the ...Be7 Tarrasch) enough to keep on playing it, now and then, whenever I wanted a break from 1. e4 e5. Not for the first time in my life, it seems that I was getting into something just when everybody else was getting out, because if there was a surge of enthusiasm for the French Defence, at about that time, the surge stopped surging when I joined it. We've not seen much of the French, at the highest level, in the past few years. At the highest level of all, we've not seen it since 1978. 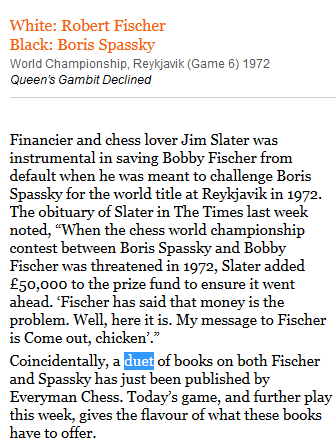 Sir, I read with surprise Bernard Levin’s statement in his article on chess (November 21) [sic – JB] that "it has never incurred ecclesiastical displeasure", as not long before the end of the sixteenth century Muslims, Roman Catholics, Jewish and Anglican religions had at one time or another forbidden the playing of the game. Muslims have a reference to chess as being a form of idol worship in the Koran, though after the prophet Mohammed’s death the decision was altered on condition that no exchange of money or improper language took place. 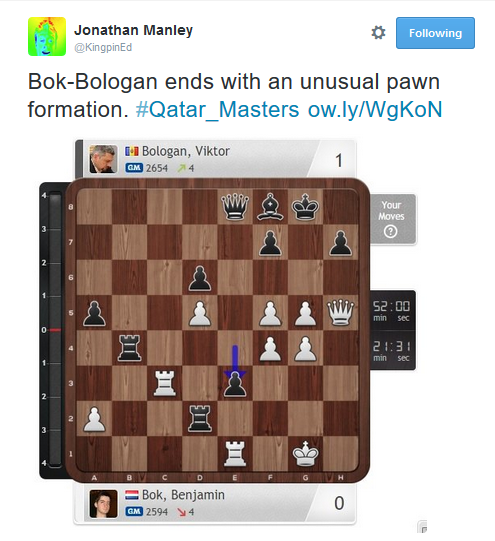 Think of the situation of chess today if this were generally implemented! Various ecclesiastical decrees, for example those by the Worcester Synod in 1240, and in France by the Provincial Council of Beziers in 1255 were made after an argument between the Bishop of Octia and the Bishop of Florence ended, with the result that the Bishop of Florence did penance for transgressing the Canon Law. 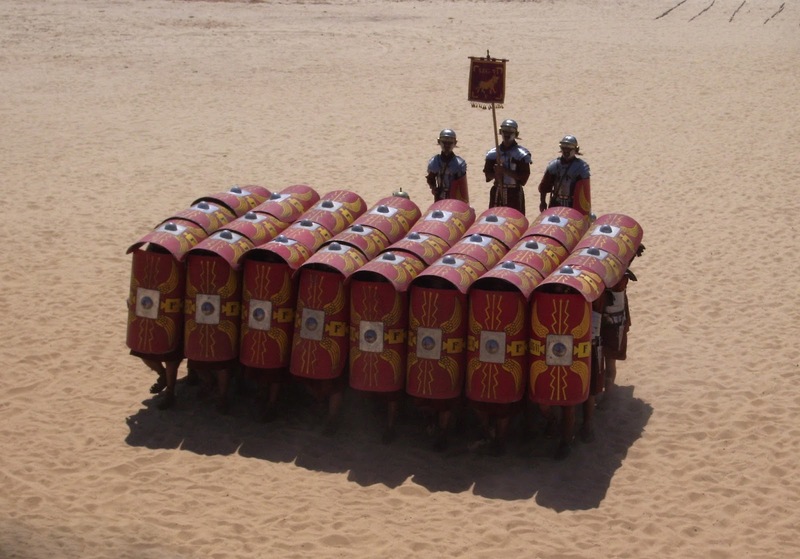 Knights Tempar up until the fifteenth century were forbidden to play chess, and from the rules of Apostolic Canon, at 1110 a monk in Eastern Church wrote that the penalty for playing was excommunication! So if chess be the eighth deadliest sin, I stand condemned. Sir, I asked a rabbi (himself a keen player) whether it was sinful to play chess on the Sabbath. He said that the way I played it was a sin to play any day of the week! 38 years on now. Does anybody know if these two guys are still around? Last word, unless it isn't, on that Stephen Moss article. Two points. a. What do they all have in common? b. This being so, why point the finger at the forum especially? clueless...small-minded...bloody stupid...grossly immature, petty, pusillanimous. However, at no point are their reasons for acting given, nor are any of the people criticised quoted in response, even though we know that other people were interviewed as well as those quoted. The Guardian's Editorial Code includes the following clause. Is there any reason why, on this occasion, there was no "obligation to allow the subject the opportunity to respond"? What does the writer think "duet" means? Is Ray Cyrus Lakdawala in disguise?